Luxurious comfort, the largest interior in the segment and a weight saving of up to 325 kilograms – the new edition of the Audi Q7 sets new standards. As the most advanced Q model ever made, the second generation Audi Q7 offers a new dimension in design, performance and technology. Its innovative assistance and infotainment systems along with revised engine performance make the large SUV an impressive package. Its new engines consume significantly less fuel than the previous model and reduce CO2 emissions by as much as 50 g per kilometre. The Audi Q7 was first introduced to South Africa in 2006 and since then has sold in excess of 4,700 units locally. As of October 2015, the second generation of the successful C-segment SUV will be available at all Audi Dealerships in South Africa. The proportions of the new Audi Q7 are slimmer than its predecessor; the new model is 5.05 metres in length, 1.97 metres in width, 1.74 metres in height and has a wheelbase of 2.99 metres. These dimensions make the new generation 37 mm shorter and 15 mm slimmer, while the height has remained approximately the same. The Audi Q7 reveals many elements of the new Audi design idiom for Q models: it’s much more powerful and incisive, relies more on clearly accentuated lines and emphasises the horizontal through its more geometrical design. The Audi Singleframe grille is clearly three-dimensional in form; its horizontal toothed structure and its wide framing create an awareness of the status and presence of the vehicle. The side view continues the play of lines and surfaces. At the upper corner of the headlight the so-called “blister line” begins, which segments the side. Above the wheels it conveys an impression of restrained muscularity – a subtle homage to the classic quattro models from Audi. The wheel arches appear large and incisive; this highlighting of the wheels is also typically quattro. 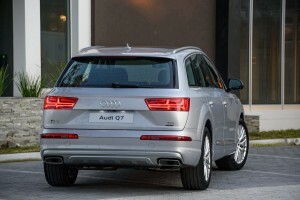 The rear of the Audi Q7 is characterised by three horizontal lines. They run in the area of the rear lights, number plate and the bumper. They structure the rear and emphasise the width therefore lending the vehicle a more sporty appearance. LED rear lights are standard on all Audi Q7 models. They continue the styling of the headlights, creating an especially progressive look. The underbody protection in the rear is an eye-catcher, it’s wide and includes a diffusor in aluminium look as well as rectangular tailpipes. The wrap-around tailgate gives the rear a wider appearance and facilitates loading and unloading. It offers electrical opening and closing as standard. Xenon headlights are offered as standard, however full LED headlights and Matrix LED headlights are also available as an option. Each Matrix LED headlight divides its high beam into 15 individual light-emitting diodes paired with three reflectors. A camera on the interior mirror analyzes the traffic situation. Given this information, the control unit individually turns the diodes on and off, or dims in them in 64 stages each, depending on the situation. Together with the LED and Matrix LED headlights, Audi provides dynamic rear turn signals – their individual segments light up in rapid succession from the inside outwards. The interior of the new Audi Q7 is extremely variable, user-friendly, comfortable and above all generously dimensioned. It offers the most spacious interior in the premium SUV segment. In terms of knee space, shoulder space and headroom (plus 41 millimetres in the front row), it even surpasses the dimensions of its predecessor – although the exterior of the overall car has become slightly more compact. The first row of seats displays progressiveness and quality through the sophisticated double inlays, Audi virtual cockpit and the new MMI operating system – while in the second and optional third row of seats, the whole versatility of this vehicle concept is revealed. If selected, the third row of seats are raised and lowered electrically for greater ease of use. Customers can also choose to personalise their interior with Audi exclusive during 2016. The new Audi Q7 comes with a large, highly variable luggage compartment. When all seven seats are occupied, it has a capacity of 295 litres. The five-seater offers 890 litres, and 2,075 litres with the second row seat backs folded down. Compared with the predecessor model, the loading sill is lower by nearly five centimetres. 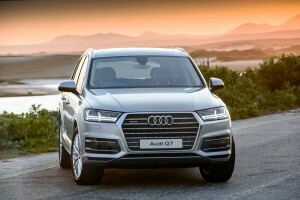 The new Audi Q7 will be launched in South Africa with one engine initially. The 3.0 TDI available now, delivers 183 kW of power and 600 Nm of torque from 1500 to 3000 rpm. Acceleration from 0 to 100 km/h takes 6.3 seconds, with a top speed of 234 km/h. On average, the 3.0 TDI consumes only 5.7 litres of fuel per 100 kilometres, emitting only 149 grams of CO2 per kilometre. A petrol engine in the form of a 2.0T FSI with an output of 185 kW and 370 Nm of torque will be available in South Africa in January. Newly developed from scratch, the drivetrain in the new Audi Q7 is much sleeker than its counterpart in the previous model, undercutting the old weight by 20 kilograms. A new quattro centre differential replaces the previous transfer case, and is integrated in the eight-speed tiptronic. The new eight-speed tiptronic is designed as a classic torque-converter transmission, shifting smoothly, quickly and spontaneously. Its high gear number allows frequent operation of the engine close to the ideal load point, while the high spread of 7.1:1 provides a long ratio at the uppermost gear for low rpms and low fuel consumption. On the other hand, the lower gears have a sporty, short ratio. Under normal driving conditions, the centre differential, designed as a planetary drive, distributes the power between the front and rear axles in a 40:60 ratio. Should the wheels of one axle lose their grip, it can transfer as much as 70 percent of the power to the front and a maximum of 85 percent to the rear without any delay. These lock-up values are higher than with the predecessor model, allowing a better defined distribution of torque and a high-precision, barely noticeable interplay with the control systems. An intelligent software feature, the wheel selective torque control supplements the quattro drive. If one of the driving wheels on the inside of a curve bears an insufficient load, the torque control’s management system initiates a minimum and precise brake intervention at that wheel. Self-steering behavior remains neutral longer, and handling becomes more precise, agile and stable. Compared with the previous model, the ground clearance of the Q7 has been lowered by 50 millimetres, in part through lower installation of the engine. The suspension has also been redesigned from scratch. Relative to the previous model it is over 100 kilograms lighter – an important factor for agility. The standard-equipped driving dynamics system, Audi drive select, completes the versatile character of the new Audi Q7. Standard are the eight-speed tiptronic, electromechanical power steering, engine management, the automatic air conditioning and the engine sound. Added are options such as adaptive air suspension, the new all-wheel steering, the headlights and the adaptive cruise control. The adaptive air suspension can adjust the ride position of the body as required. At the offroad level, which is limited to a speed of 80 km/h, the body lies 25 millimetres above the normal level, while at the lift level another 35 mm are added. For comfortable loading the body drops 55 millimetres at the press of a button. At 120 or 160 km/h the body is automatically lowered by 15 mm, to reduce drag and increase stability. The lowering thresholds differ slightly depending on the mode set in Audi drive select. When it comes to lightweight construction, the new Audi Q7 is a benchmark in the large SUV segment. The unladen (without driver) 3.0 TDI registers 1,995 kilograms. That’s up to 325 kilograms less than the predecessor model. The body significantly contributes to this advancement: Its multi-material construction saves up to 71 kilograms in weight. The doors, including the complete outer shell are made of aluminum, contribute an additional saving of 24 kilograms. Engineers have also exploited large weight-saving potential in the chassis of 27 kilograms at the front and 40 kilograms at the rear suspension. The powertrain contributes a saving of 20 kilograms and the exhaust system 19 kilograms. Even with a trailer, the Audi Q7 cuts an excellent figure. It can haul up to 2.7 tons (on 12% gradient), and 3.5 tons with the adaptive air suspension. Joining the electrically swiveling trailer coupling on board is the trailer maneuver assist system, which aids the driver when driving with a trailer.